Please note: The information listed below applies to select physicians within our the MSR network and is subject to change at anytime. If you require information inselecting a board certified pain specialist in New York / New Jersey call 800-949-6100. Injured on the job? 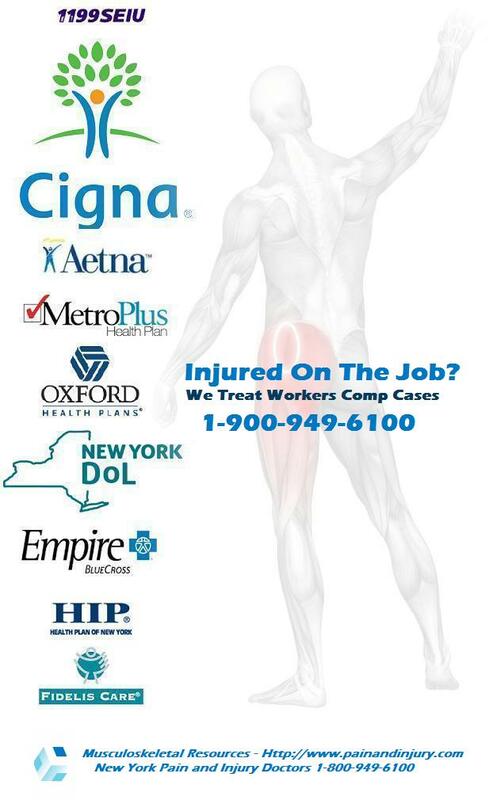 Need help with your workers comp claim. Our pain management doctors provide Independent Medical Exams (IME) For Workers Comp Claims. Please note** the accepted health plans listed below are subject to change without notice. The list reflects insurance accepted by individual specialist throughout New York. If you don't see your insurance company on this list, please contact us at 1-800-949-6100 for a referral. No Fault Insurance No-fault automobile insurance. MSR select physicians treat back pain, neck pain, knee pain, shoulder pain, and joint pain. Injured in a work accident, slip and fall or car accident? Speak to an injury doctor today: 1-800-949-6100.